Look at this beauty I got to do for my second ever custom quilted quilt! 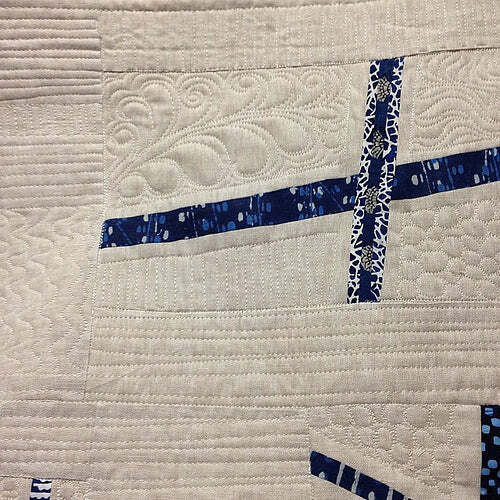 For those who may not know, longarm quilting is considered 'custom' when it takes into account the quilt pattern and seam lines, rather than being an 'allover' or 'edge to edge' which treats the whole quilt the same. My awesome customer (and friend) Judy Skwar gave me this gorgeous modern crosses quilt made with inspiration and techniques from Quilting Modern: Techniques and Projects for Improvisational Quilts by Jacqui Gering (aka Tall Grass Prarie Studio) and Katie Pederson (aka Sew Katie Did). Judy made this for her (VERY LUCKY) daughter in indigo blues and essex linen. It is so yummy. And I'm lucky too because I got to quilt it! I wanted to do straight lines and pebbles. 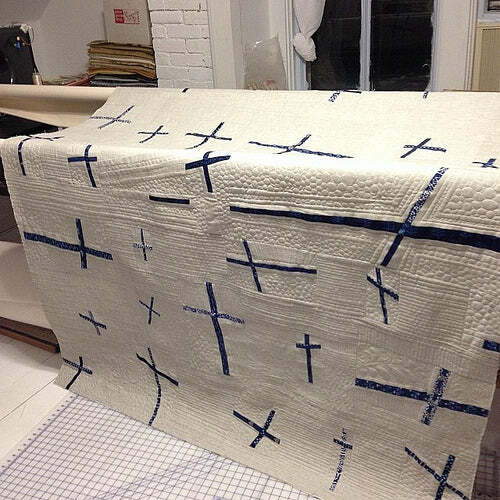 I wanted to echo the cross shape in the quilting. I wanted to do some stitch in the ditch. I got a lot of practice in with this quilt! I used a linen color Glide thread by Fil-Tec. 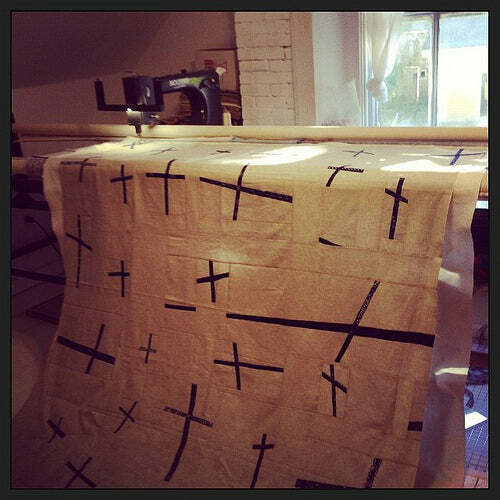 I like how the quilting lines extend the crosses in some places. You can really see all those pebbles surrounding the crosses on the back. Pebbles are fun! Judy called this one "Newport Crosses" because her daughter lives in Newport. Nice, huh? I am dying to do more quilts like this. Send me some!